Key Technology's Manta system now has three-way sorting capability. The Manta sorter features two ejector systems, allowing food processors to eject food or beverage product that can be reworked and recovered separately from material sent to waste, typically foreign material. Manta's three-way sorting capability allows processors to produce product quality product without losing recoverable off-grade product to the waste stream. 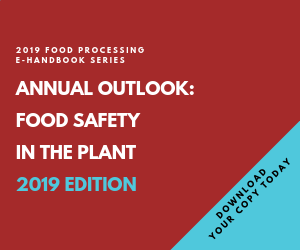 According to Key Technology, many different food processors have used the three-way sorter for multiple food safety checks. "Green bean processors are using the three-way sort to remove foreign materials with the first ejector and remove beans with remaining stems, which are subsequently re-snipped, with the second ejector, " says Bret Larreau, Optical Product Manager at Key Technology. "Potato processors are using the three-way sort to control for length."